Hi again! Sorry for the long delays between posts recently. I've been a little busier than usual, and a little less inspired :( this has happened to me before, though, and it usually doesn't last long. Hang in there and I'll be posting more frequently again soon. Anyway, on to the post! 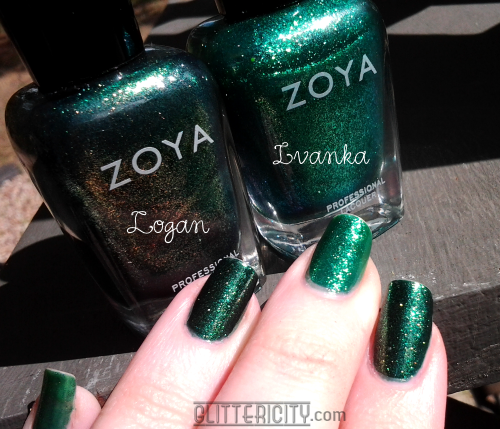 No art today, just a quick comparison between two Zoya colours--my old favourite green Ivanka, and a newer similar one called Logan. When Logan came out, I thought they'd made some kind of mistake. It looked like a dupe of her older Czech sister, and I was confused. But, while they are quite similar, there are enough differences to justify having both these beauties! 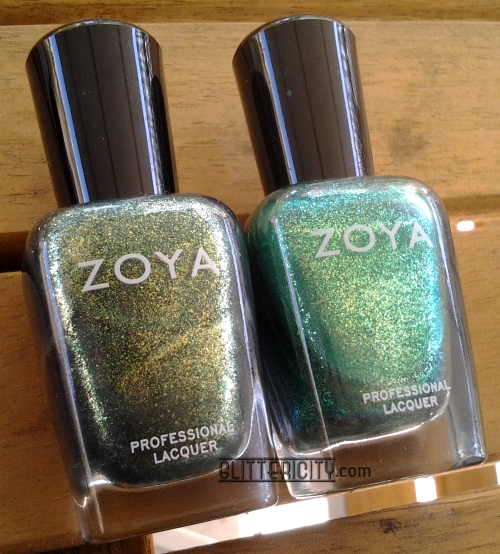 Both polishes are deep, beautiful greens, with that wonderful smooth, shimmery, glassflecky formula that Zoya is so amazingly good at creating. Logan is on my index and ring fingers here, so as you can see, it's a deeper forest green than Ivanka (small & middle fingers), which is a bit brighter--almost in the "kelly green" family. 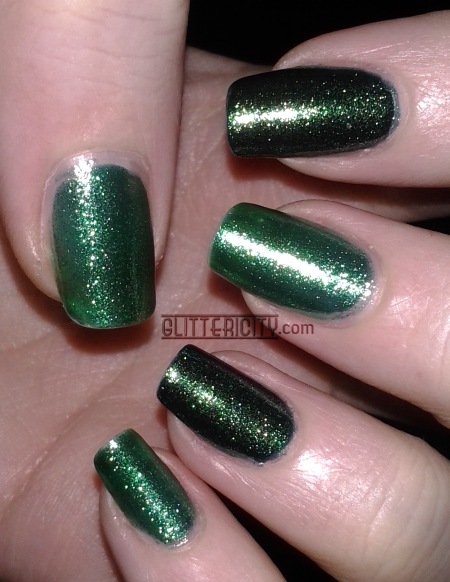 Logan's shimmer is also very golden, whereas Ivanka's is purely green. Logan needed two coats for opacity; Ivanka takes three to cover VNL. 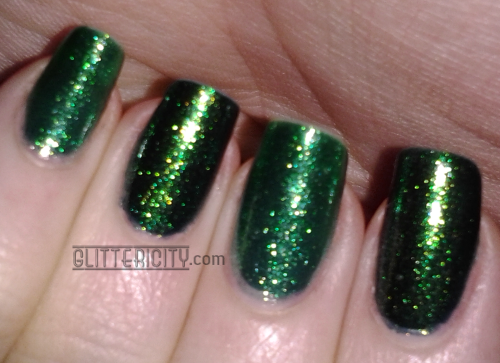 I usually wear it over a similar shade (Sally Hansen Xtreme Wear Emerald City is my favourite for this purpose) so I don't have to use as much. The verdict? 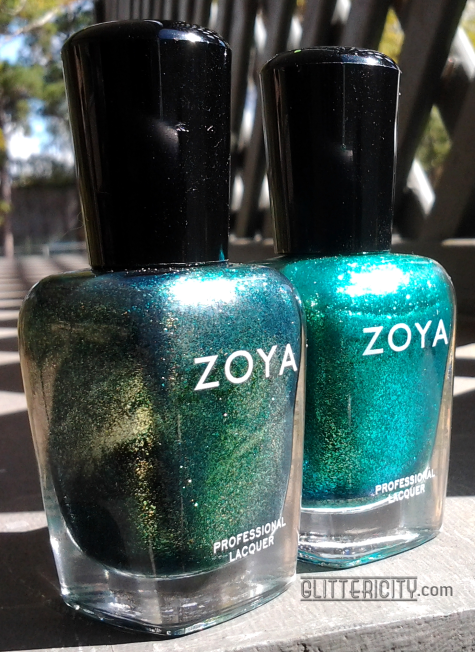 They are both absolutely beautiful polishes. If you love greens like I do, you'll definitely want to own both! They're different enough to justify the purchase, and I think they'll be beautiful together in a gradient or complimenting one another as part of a nail art design. 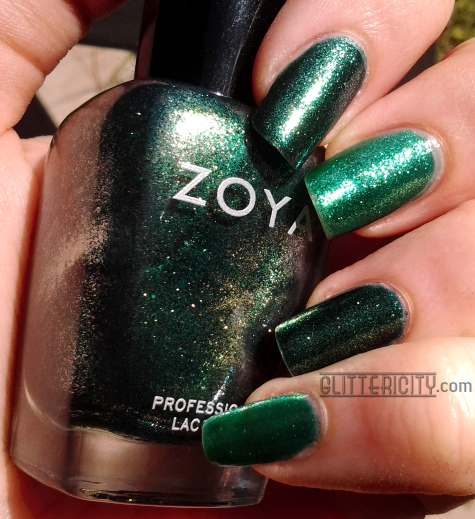 If you aren't a total polish fiend, or don't wear green that often, you could get away with just having one or the other--but you'll certainly want one of them around during the holidays! Ivanka is still my favourite, but only just by a hair.